We have a full house these days—six girls and five adults. Our good friends from New Jersey bit the bullet and made the trek to Berlin to see us for Christmas. They found a flat just one block away from us, an easy walk back and forth each morning and evening. On December 23 we fanned out across the city, all eleven of us, some heading to Museum Island for a self-guided walking tour of the heart of the city, others of us setting off to a multitude of markets to track down all the groceries we’d need for the coming days, when the city all but shuts down. After months of daily shopping, this ban on shopping for a string of days, just at the time when we are planning our biggest meals, had led to much anxiety and discussion. It is serious business, Christmas meals, and for us the focus is the Wigilia, the Christmas Eve meal. Ours is modeled on Polish traditions brought by M’s mother’s side of the family so many years ago. Christmas wouldn’t be Christmas without kapusta, the whole pea-cabbage-dried mushroom soup, or the baked fish, the stewed prunes, or the homemade pierogies. 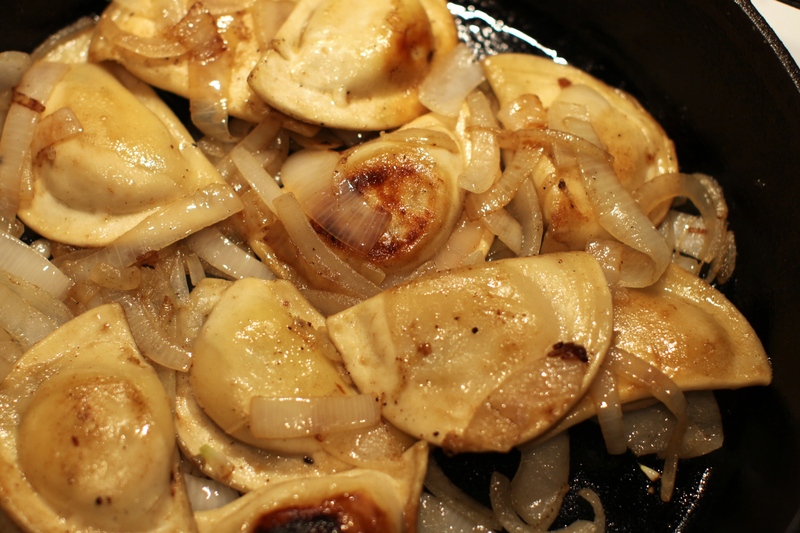 Everyone’s favorite is, of course, those potato and cheese-filled pierogies, the dough light as air. On the 23rd, sitting on the S-Bahn across from our visiting friends, M asked Larissa, “Do you have the pierogi recipe with you?” Larissa laughed and said no. She saw M’s dark look but assumed he was just kidding. It wasn’t her recipe; she had seen it at M’s sister’s place in New Hampshire a month or so ago on a recent visit, but hadn’t brought it with her. There is mystique around this recipe. I have handled the original myself. It is in spidery thin ballpoint pen on an ancient piece of lined paper, faded, almost waxy and see-through after all these years. It’s in the hand of Coci Jo, the eldest of all of M’s mother’s siblings, who died at 93 just last March. Larissa hadn’t thought that she could be the keeper of the pierogi recipe any more than I could; we’re not Polish; we somehow don’t have the right to put a claim on such a piece of family history. And this in spite of the fact that I married into the family 17 years ago, and Larissa was “adopted” into the family on her 40th birthday—M’s brother and father, lawyers both, drew up the mock papers and presented them to her around the dinner table on her birthday one rainy August evening after a family party. No, Larissa had not brought the recipe. “Nina was going to email it to you,” she told M, but M was rattled; Christmas Eve was the following day! Some years we start assembling the many trays of pierogies on the 23rd, but as it was we were still bringing in the supplies. We returned to the apartment, and cooking began for the dinner of the 23rd, but it was clear that M was getting more frantic by the moment. To not have that recipe was unthinkable. Cutting it so close was making him crazy. “No appetizers served until we have that recipe!” came his warning from the kitchen, and if there ever was a pierogi red phone, it lit up that night. No one responded right away, but the effort was sufficient for M to serve the appetizers. There’s nothing particularly traditional about our meal on the 23rd; anything goes on that day in our household. We had caprese and goat cheese and bread, followed by gnocchi with garlicky arugula and tortellini with red sauce. But on Christmas Eve, nothing could be left to chance. We must have kapusta. We must have fish. We must have potatoes. And stewed prunes. And come hell or high water, there would be pierogi on the table. But not just any pierogi. From Berlin we’re less than three hours from the Polish border, but there was a distinct desperation in the air for that particular recipe honed by a few Polish descendants in small-town Pennsylvania and big-city Chicago. There are dozens, maybe hundreds of pierogi recipes online with Polish credentials, but I didn’t do a wholehearted search knowing we’d never use it. We saw some in a freezer case in a shop in Charlottenburg during our food shopping spree, but I didn’t even mention them; somehow the thought of buying pierogies was not an option. It’s fun to see that pierogi are sold elsewhere, such as Pittsburgh or Chicago, and it might be okay to buy some if you are as far from Christmas as possible, like early July or so, but no family member would ever buy pierogi to serve at Wigilia. Or so I thought. Several hours later the email came in; the recipe was there for us in all its glory. Christmas would be saved. In so many ways the menu is about honoring M’s mom, the one who spoke Polish, the Babci of the family, the mother or grandmother to us all. She was warmth embodied, always ready with a hug for you, usually a scotch at her side. The pierogi recipe may be her oldest sister’s, but it’s hers in spirit, and making this meal the way she used to is about honoring her. Like Coci Jo, she died only last spring. Her absence remains a gap in all our lives. But the traditions are there to keep us all oriented and remind us of the many Christmases we spent together. The pierogi panic drew tight the laces of the family. Somehow the thought of the siblings and cousins back in Doylestown making the same dishes we made in Berlin nullified the distance of time zones and made the crossing of the Atlantic a mere plane ride away. We may as well be a few hours down the road. We Skyped with the Doylestowners on Christmas Eve, our kapusta simmering on the stove and the pierogies warming on a tray in the oven, when the startling word came through—our Pennsylvania counterparts were not making their own pierogies this year. M’s youngest sister lives in Pittsburgh, and she was able to buy some from a Polish shop from women who spoke Polish—something akin to our Charlottenburg shop. It certainly saves a lot of time not to make pierogies. You have to make the dough, make the filling, roll out the dough and stuff them; boil batches of them until they float, then fry them with onions until they’re brown. Keep warm in the oven until they’re ready to serve. They are well worth the time they take to make. But indeed, there are bona fide Poles around the world who make lovely ones if you do not have the time or inclination to make them yourself. Maybe the question comes down to who you’re making them for. If it’s for the pride of your kitchen to be able to dish them up and enjoy them knowing you yourself made them, that’s one thing. If you’re doing it to preserve the honor of someone who is no longer with us, who will never know you did it, that’s another. Making the pierogies the way she remembered them, I thought, was for Babci. The meal was served, and as ever, the kids mostly picked at their kapusta, declined to try the fish, had the obligatory no-thank-you bite of the prunes, and attacked the platter of pierogies with gusto. Sitting around the Christmas tree after the meal, M’s brother gave out his gifts. He gave each of our girls a piece of his mother’s jewelry, items that she had worn before she passed away last spring, mere weeks after her eldest sister died. E and C each received pins, and they bent down and pinned them to the scarves they were wearing. S received a beaded necklace, long, thin strands of amber beads. She held them up and recognized them with a start; being the oldest grandchild, she has many memories of being with Babci. But the sight of them was too much for her; she clung to Geoff, helpless in the tide of memories they unleashed. And more than anything else, that moment of being brought back to the edge of grief made Babci present and real to us, and all eleven of us sat among the sounds of sniffles and Polish Christmas carols, remembering her together. “She always wore these!” S said, shaking her head in disbelief at the beads in her hands. “I can just picture her wearing them.” She helped us all see her again. As for the pierogies? It turns out they were just for us. This entry was posted in Parenting, Sabbatical and tagged Berlin, Christmas, Christmas Eve, Doylestown PA, pierogi, Polish, recipe, S-Bahn, Wigilia on December 26, 2013 by Jill M..
I’ve been out of the country the past 2 weeks w/out (much) access to email. I steeled myself from work for a few minutes to read this post. What a delight! Thanks, Rebecca! I hope you had a great trip.